In June 2003, the nonprofit Thirty Meter Telescope (TMT) Observatory Corporation was founded by a collaboration of organizations: the Association of Canadian Universities for Research in Astronomy, the University of California, and the California Institute of Technology. This is their goal: to construct a highly advanced telescope at an advantageous location in order to explore the universe beyond the limits we have reached. By the end of 2009, this partnership expanded to include other esteemed national and international organizations. After a seven-year public and agency review, TMT received all required state and county permits. In May 2010, the TMT Final Environmental Impact Statement was approved after a two-year public review and was not challenged after its approval. Maunakea, with its summit at 13,796 ft (4,205 m) is the tallest summit in Hawaii. It is known to be a prestigious, world-renowned astronomical site and also as a special place in the Hawaiian culture. The Ancient Hawaiians were astronomers by nature. They used the stars and other celestial objects to expertly navigate the Pacific Ocean to the Hawaiian Islands as well for many aspects of the culture such as fishing and agriculture. King Kalākaua was, in fact, an early and ardent supporter of astronomical observation in Hawaii. Currently residing on Maunakea’s summit are telescopes such as the Keck Telescopes, Subaru, Gemini, and the Canada-France-Hawaii Telescopes. The University of Hawaii (UH) made an agreement in the Mauna Kea Reserve Master Plan that no more telescopes would be constructed on the pu’u and top of Maunakea. Therefore, the northern plateau in Area E was identified and agreed upon to be the next observatory location because of its lack of visual, archeological, cultural, and biological impact. Neither TMT nor any of the other telescopes are permanent fixtures; eventually they will all be removed. In the grand scheme of time, the residency of these telescopes on the mountain will be but a mere blink of the eye. During the time TMT is located on Maunakea, the telescope will greatly benefit the local communities of Hawaii Island, the State of Hawaii, and the world with its anticipated scientific contribution. One of the many benefits for Hawaii that TMT brings is its substantial payment for lease rent. Eighty percent of the lease rent goes to the Office of Mauna Kea Management, while the remaining twenty percent goes to the Office of Hawaiian Affairs. For the first three years after 2014, TMT will pay $300,000 per year. The lease rent payment increases at further milestones of the telescopeʻs construction and will eventually pay $1 million per year while in operation. TMT also launched The Hawaii Island New Knowledge (THINK) Fund in 2014 to contribute $1 million per year to be distributed amongst various Big Island STEM programs, schools, classes, and students. This supportive petition has not been organized or initiated by the TMT Observatory Corporation. I have created this document so that my belief, which I share with others, will be heard. I am an 18 year-old, Native Hawaiian girl in high school with loving passion for astronomy and my culture. 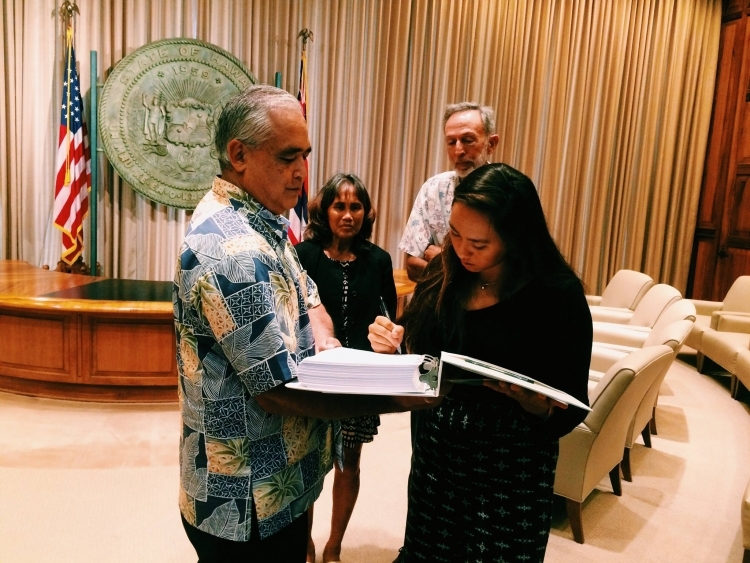 Photo: Mailani Neal recently giving the WeSupportTMT petition to Hawaii Governor Ige’s Chief of Staff (Mike McCartney). Thanks to Barry Neal for the photo. We, the undersigned, support the TMT Project and encourage its continuation to completion. The We Support TMT petition to Hawaii State Governor Ige was written by Mailani Neal and is in the category Media Issues at GoPetition.